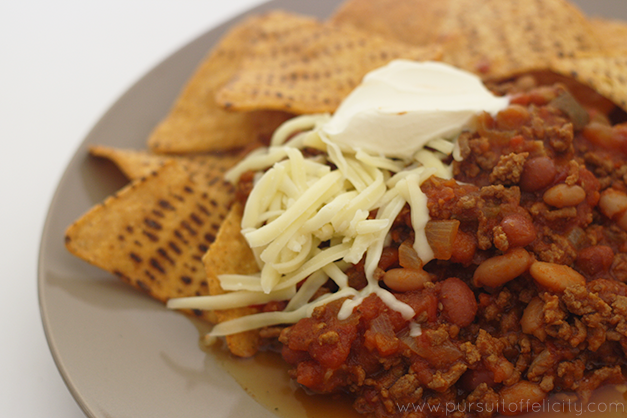 Pursuit of Felicity: The BEST Slow-Cooker Chilli Recipe! 1. Brown mince and onion with olive oil together in a large frying pan, then transfer to a colander and drain/rinse off the excess fat before moving to your slow cooker. 2. Turn your slow cooker onto a low heat and add your chilli powder, ground cumin, diced tomatoes, red kidney beans and salsa to your mince mixture, stirring until well combined. 3. Place the lid on your slow cooker and cook for 5-6 hours on a low heat. You will find that the mixture becomes quite watery as it starts to cook, so 5-6 hours of cooking time is essential. 4. Serve nacho style over some corn/tortilla chips (Mission original tortilla strips are my favourite!) with cheese and sour cream on top, on a bed of lettuce, or even over some homemade fries (chilli fries are my heaven!). Oooh! I'd love to see some slow cooker curry recipes. :D Curries are my fave!